Boston Loves Paris: They Can't Keep Us Down! Cyril and Claudia had good ideas about bringing a new bicycle upstairs every night (for safety AND strong arms). Angela thought Claudia was right about the walls. Angela did not want to follow Guillaume up the stairs every night with a bucket of paint to cover the smudges on the wall that were sure to happen. Guillaume, however, is brilliant. He found a FOLDING BIKE! He can fold it and bring it upstairs every night, and now nothing bad can happen to it. It will be warm and dry, just outside our apartment door. Angela ordered it for Guillaume online yesterday, and it will arrive this week. This is what it looks like un-folded. Angela thinks it is tres mignon. Guillaume isn't so sure. Of course there will be photos when the bicycle arrives! I've seen that bike before. It's a Citizen; they weigh about 30 lbs - kind of heavy for carrying up steps everyday. 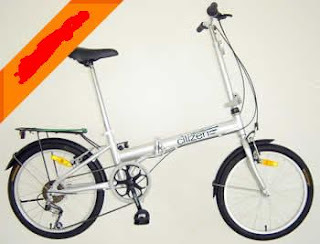 I know of a similar folder that weighs just 24 lbs - the Superlite folding bike. It has 3 speeds, fenders, a kickstand, carry rack and folding pedals. It costs less than the Citizen and requires less maintenance (internal hub & coaster brakes). Oh, no! That "Superlite" is one ugly bike! Ours is definitely cuter. I think maybe, that "L" works for the Superline company!!! And, 30 lbs. is nothing for Guillaume. I think that folding bike is a fine start. Perhaps this summer I can introduce Guillaume to the polished perfection of a Harley Davidson !